BEFORE the Prime Minister addresses the nation this evening and confirms Government’s decision to shut down the refinery of state-owned Petrotrin, the Opposition Leader is urging him to reconsider. Instead of the shutdown, Kamla Persad-Bissessar believes TT should attempt to partner with its Caricom neighbour, Guyana–where billions of barrels of oil have been discovered over the past three years–to refine its oil. Guyana’s oil discoveries were made by ExxonMobil, the largest publicly traded international oil and gas company, which is leading the exploration efforts there. 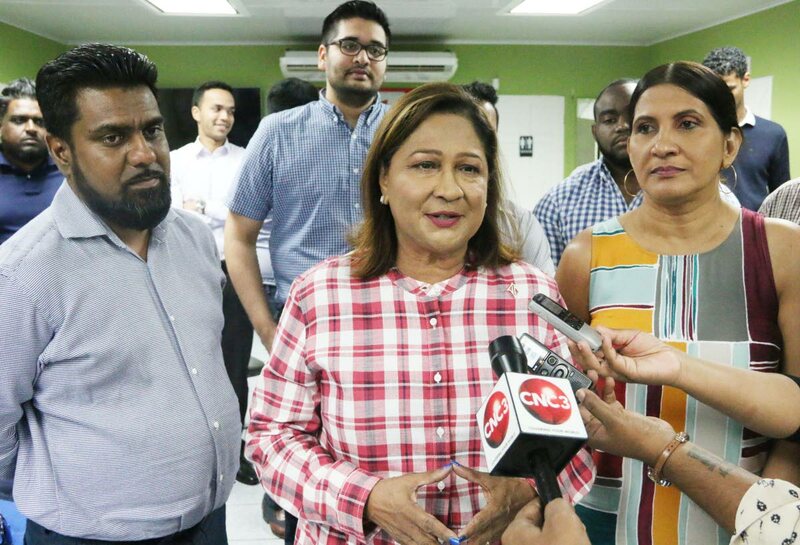 Speaking to the media at her constituency office in Penal yesterday, Persad-Bissessar said she hopes Dr Keith Rowley’s good sense will prevail. “I understand Guyana has found another well and they are producing, can we not group in some way and find a way to work together as a Caricom (sic) where we can help them refine their oil?” she asked. “I am calling on him to let good sense prevail to be very cautious in making such a drastic and dangerous move, this will have a ripple effect throughout the economy and the country.” She said while she understands that Guyana will build their own refinery in the coming years, this move now could help save Petrotrin and the national economy. Persad-Bissessar is also questioning whether the closure of the refinery will stop the public from getting details about the fake oil scandal and the failed World Gas to Liquid (WTGL) plant. She also weighed in on the Galleons Passage’s trial voyage to Tobago yesterday morning, saying, “I think many people were excited and anxious because we have been waiting so long to get this connection with the seabridge and once again the incompetence, mismanagement and corruption in the Rowley government, we are left without that seabridge, we have bought a boat that is now really just junk, scrap iron. Reply to "Offer to refine Guyana’s oil"